The ideal chair to complement any modern kitchen countertop, the Jericho Counter Chair from Zuo Modern will dazzle consistently. This exceptional chair includes polyblend upholstery that will maintain its appearance for an extended period of time, along with a mid-century modern design that helps the piece stand out. And with the chair's slim chrome footrest, you'll be able to sit back and relax for hours. Enjoy a wonderful counter chair that is available in multiple eye-catching colors � the Jericho Counter Chair. Offered in multiple dazzling colors. Features a mid-century modern design, making the chair a stellar choice in any contemporary dining room or kitchen. Polyblend back and seat deliver amazing comfort. Includes a slim chrome footrest to make it easy to sit back and relax in this seat at any time. 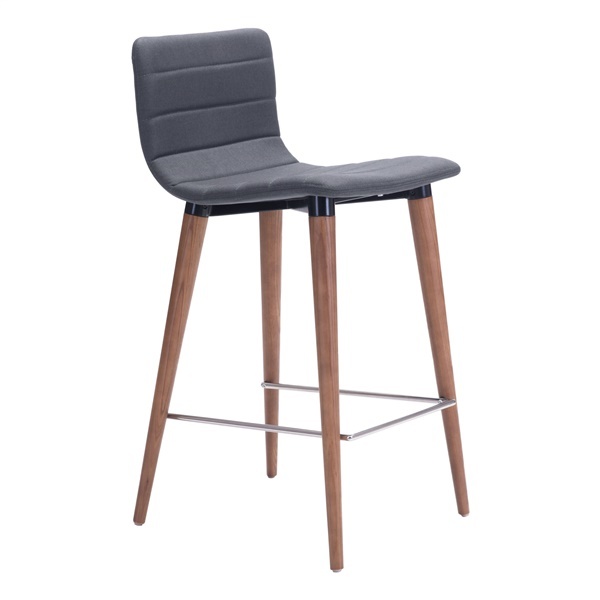 All wood legs in walnut finish further enhance the chair's overall appearance and provide consistent support.